A scientific project to invent matter transference accidentally makes time travel possible. The catch is that only people 20 years old or younger can survive repeated trips back and forth. Expeditions into the future have revealed a coming ecological disaster, and a secret plan is set in motion to send a group of college age kids into the future with the resources to start a new civilization. As the project is threatened with a takeover by the government, the kids find themselves trapped in the future and forced to survive while trying to understand the nature of the disaster that will wipe out humankind. 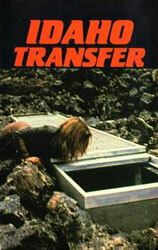 Idaho Transfer hits all the notes of 1970’s ecological minded science-fiction. Firstly, it’s deeply pessimistic. All the good intentions in the world collapse under the weight of human frailty and weakness. The film proposes that we are going to destroy ourselves, and even with that foreknowledge, it’s inevitable. There is an encroaching doom, often visualized by the desolate landscape and punctuated with silence. Authority is never to be trusted, the government, the heads of the project, and even anyone who assumes leadership in the group of youthful survivors could become the enemy. The cast is composed of young actors, mostly unknowns, who did not go on to do much of anything after this film. They all bring a sense of naturalism to their characters, which match the equally naturalistic tone and presentation of film as a whole. Often our central character Karen (Kelly Bohanan) comes across as immature, self-centered and unlikable. Whether this is due to a natural presentation of her as a person, or just the result of an inexperienced actor is hard to tell. The film is definitely a slow burn as we watch the inevitability of the situation slowly grind away any hope left in the survivors. There are some great chilling moments, Karen desperately searching for help as her sister quietly lies dying on the floor of the lab and the discovery of a vast freight train filled with bodies being a couple of highlights. The film ends on a moment that is either supposed to be a very dark joke or a bit of misguided social commentary. It doesn't quite work as well as it should, but at the same time it doesn't do much damage to the film as a whole. Idaho Transfer appears to only exist as a video tape sourced pan and scan presentation, and you can often find it in any number of those 100 movie DVD sets. The film damage and washed-out image may actually enhance the overall eeriness of the story, but it would be nice to see it in its original framing and color one day. With such a little known film, starring no one in particular, I don’t think we’re going to see a cleaned-up Blu-ray of it, but unlike the grim eco-horror future, hope springs eternal. Idaho Transfer is a very good, low budget movie, which delivers a creepy aesthetic without resorting to a lot of grandstanding or overly dramatic moments that would detract from the quiet horror of the apocalypse.